Michael Kahme, Esq., Managing Partner of Hill Wallack LLP, was sworn in as Treasurer of the Mercer County Bar Association in a ceremony on Thursday evening, January 24th at the annual Installation Dinner at the Trenton Country Club in West Trenton, N.J.
Kahme, in addition to heading the firm, concentrates his legal practice in all matters of creditors’ rights and bankruptcy, including workouts, commercial foreclosures, asset purchases, receivership actions, pendente lite sales, lender liability lawsuits, representation of secured creditors in bankruptcy cases, commercial litigation and fraud litigation. Kahme also has represented institutional purchasers of assets and businesses out of bankruptcy estates. Kahme is admitted to practice in all federal and state courts in New Jersey, the U.S. District Court for the Southern and Eastern Districts of New York, all state courts in New York, and before the U.S. Court of Appeals for the Third Circuit. He earned his law degree from the University Of Miami School Of Law and is a graduate of the University of Rochester. 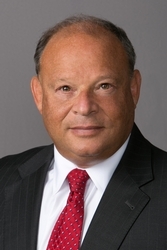 He formerly served the Mercer County Bar Association as Secretary in 2018 and as Trustee from 2010-2017.